In order to explain how ECOCUT pro works in detail, we must first of all look at why wiper blades actually start to smear. To ensure the wiper blades can wipe the windshield without smears, brand new wiper blades have a “sharp” edge; see illustration. Due to weather conditions, dirt and the remains of insects, the edges of the wiper blades are worn down over time. Under the microscope, a radius and minute amounts of damage are clearly noticeable. With its patented cutting technology, the ECOCUT pro cuts the rubber part precisely, thus restoring the wiper blade’s original “sharp edged” form. As a result of this, the wiper blade can work properly again, and wipe the windshield without smears just like when they were new. 1. Lift up the windshield wipers and clean the wiper blades thoroughly with the sponge provided. 2. When using the device for the first time, select slot (1) and insert the wiper blade. 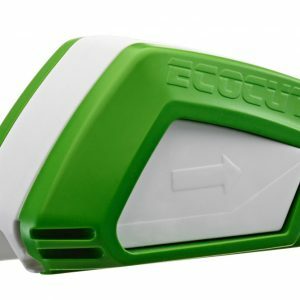 Tip: to ensure the ECOCUT pro glides smoothly over the wiper blade, simply add a bit of washing up liquid to the guide slot. 3. With an equal amount of pressure, pull the ECOCUT pro along the entire length of the the wiper blade.